In the grounds of the Castletown Estate, near the Irish town of Maynooth, is a large stone structure comprising of interlocking arches, adorned by stone pineapples and eagles, and topped by a massive obelisk pillar. The structure was supposed to mark the rear entrance to Castletown house, but in reality, it served no real purpose—it’s a folly. Its construction, however, did have a purpose. The Conolly's Folly was commissioned by Katherine Conolly, the philanthropic widow of William Conolly, who was a prominent member of the Irish House of Commons and was the wealthiest man in Ireland at the time of his death. The 42-meter-tall folly was constructed in 1740 when the Irish famine of 1740-1741 was at its worst. Katherine wanted to feed the starving farmers, but rather than giving away food for free, she engaged them in the useless task of building the gateway so that the villagers could earn and eat with dignity. A century later, when Ireland was under the grip of yet another potato famine, hundreds of thousands of Irish were employed by the government in similar purposeless projects. They built roads that went from nowhere to nowhere, erected estate walls, built piers in the middle of bogs, and constructed fantastical buildings in the grounds of the elite. These structures are collectively referred to as ‘famine follies’. It’s hard for us, today, to understand why the government made people already weakened by starvation to toil for food when they could have just fed them. But back in those day, society—especially the well-off— had very egoistic views about poverty and debated on who should bear the cost of helping the poor. The general idea was that charity in the form of hand-outs was a bad idea and reward without labour was bad for character. Instead, the government established institutions known as workhouses where the poor and the unemployed had to work to receive support. While originally not a bad idea, the so-called ‘poor relief’ quickly degenerated into a systematic means of punishment and a complicated system of government-funded support and protection. Before the Great Famine hit Ireland in 1845, the country’s population was over eight million. Two-thirds of those depended on agriculture for their survival, but they rarely received a working wage. They worked on small patches of land for their landlords, and then sold the crop to pay the high rent, after which barely enough was left to feed their own families. 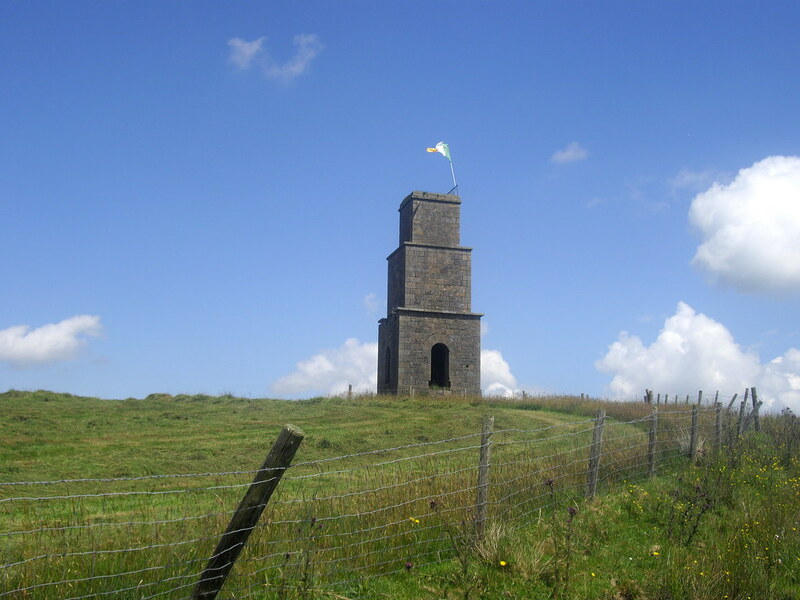 Caddell's Folly, erected by Richard Caddell, in the village of Naul. Potatoes became the main food for the farmers since only the potato can be grown in sufficient quantity. It did not require rich soil and a small patch could produce an annual supply. It was, however, subject to disease. In 1845, a disease called Phytophthora infestans, or blight, struck and the stalks turned black as the potatoes rotted in the ground. A million people died of starvation. Hundreds of thousands more tried to escape from Ireland by boarding vessels bound for the U.S. As many as one-third died en route from hunger and disease. The then prime minister, Lord John Russell, placed Sir Charles Edward Trevelyan, the Assistant Secretary to the Treasury, in charge of the government relief to the victims of the famine. Trevelyan was a strident believer in the principles of laissez-faire government and the free hand of the market. In a letter to an Irish peer, Trevelyan described the famine as an act of Providence, and an “effective mechanism for reducing surplus population”. The famine, he wrote, was “the judgement of God” sent “to teach the Irish a lesson”, and that “the calamity must not be too much mitigated”. Trevelyan believed that Ireland needed to heal itself from within, without the substantial aid from the British Government. He was of the opinion that it was not the government's responsibility to provide supplies of food or increase land productivity, but the landlords, and that the government cannot be expected to fix everything. Trevelyan kept deliberately dragging his feet in disbursing direct government food and monetary aid to the Irish, believing that doing so would have the poor become permanently dependent on the state taking care of them. Instead, he initiated a new ‘relief’ programme of public works. In the following years, more than half a million starving men, women and children were employed in the construction of follies and stone roads to nowhere. They smashed up rocks and carried the rubble to construction sites where they were fitted into place. Many of the workers, malnourished and weakened by illness, perished. In early 1847, at the height of the programme, some 700,000 Irish were devoted full-time to the construction of useless infrastructure while never quite earning enough to be able to afford to eat. The Great Famine in Ireland was a natural catastrophe of extraordinary magnitude, but its effects were greatly exacerbated by the actions and inactions of the British government. To this day, many consider Trevelyan as well as the British government to be guilty of genocide, and the Irish Potato Famine is sometimes referred to as Ireland’s Holocaust. Brackenridge's Folly in Ballyscally townland, south of Clogher, County Tyrone.